It has been and would be very busy few months for Hinrich Foundation. Alex Boome, our Program Director and other team members are on the go for the Foundation’s upcoming exciting projects. In Hong Kong, as the new school year just started, we will be meeting with 18 Global Trade Leaders who are studying in universities under the Trade career development program. In Bangladesh, we are exploring new opportunities with industry partners in the country to develop more talents in trade for the country. Sri Lanka is a totally new destination, where we will be having very important meetings with the World Bank and the Ministry of Commerce to discuss potential partnership. 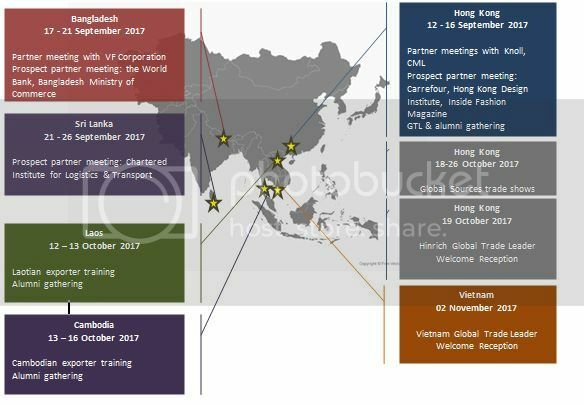 In October, Hinrich Foundation will tour Laos, Cambodia, Hong Kong and Vietnam for local exporter training, participating in two Global Sources’ trade shows and two very significant welcome receptions for our new Hinrich Global Trade Leaders in Hong Kong and Ho Chi Minh on 19 October and 2 November respectively. There will be more exciting news and events from the program team later. Our footsteps are spreading over Asia. If you happen to be in town, why not catch up with us? For more information please visit http://hinrichfoundation.site-ym.com/events/event_list.asp or contact Thu Do (Dory) thu.do@hinrichfoundation.com.